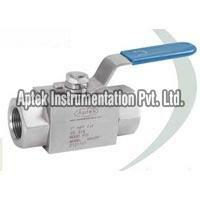 High Pressure Ball Valves that we provide offer a reliable option for the high pressure industrial applications. High Pressure Ball Valves, we offer, are recommended for the use in Oil, Gas, Petrochemicals industries where the long life is required. High Pressure Ball Valves that we offer are available at competitive prices.